According to national ratings (NeighborhoodsScout.com) the neighborhood near Cullen and Scott in Houston’s Sunnyside is being considered the second most dangerous neighborhood in America. This past July, police were called out to investigate after a man was hit by a car then shot in the face near Houston’s Sunnyside neighborhood. Officers said the victim, 30-year old Durell Taylor, was pumping gas in the 9400 block of Cullen when another man armed with an assault rifle began chasing Taylor around the street. According to witnesses, both men were Black. According to witnesses, a Black man walked up to him and shot him in the face four times. Taylor was pronounced dead at the scene, and the suspect, who was described as a thin Black male, about 5 feet 7 inches tall, 130 pounds with a mustache, fled the scene with a sawed-off shotgun, in a 2006 gold, four-door Chevrolet Impala. Another young, Black life lost. This past October, in the same area, a man believed to be in his 20’s was walking home from the grocery store about 10 o’clock, when he was confronted by three Black males, who began to argue with him in the courtyard at the Cullen Park apartments. According to witnesses, one of the suspects pulled out a gun and fatally shot the man several times before taking the victim’s cell phone, wallet and money. Two weeks ago, nine-year old Tyshawn Lee was m urdered by rival gang gunfire in Chicago, sending shockwaves throughout the country. As sad as that story is, Houstonians need not look further than its own backyard to find some of the most vicious, heinous and senseless murders in the country. There have been countless stories of violence and bloodshed that have flooded the news and terrorized the Black community; but even without news coverage, the bloodshed speaks for itself. This past Saturday, in the midst of inclement weather, hundreds of concerned citizens descended on the Sunnyside area with a message of “peace in the streets” and showed up to declare “No More Bloodshed,” with the fourth of a series of Stop the Violence “Unity and Peace Walks” that were initiated by two Black men who became sick and tired of witnessing the local headlines in Houston dealing with crime, violence, and senseless murders. Pastor E. A. Deckard, Pastor of Green House International Church, Christian Activist and Founder of CLIP (Communities Living In Peace) and Brother Deric Muhammad, Muslim Activist, Author, and Founder of Project Forward, came together once again with the hopes of reclaiming and restoring communities in the Greater Houston area that have been hit the hardest by senseless violence. Muhammad said that there is a War on ‘Two Fronts’ in the Black community that must be addressed. More than nine years after her son was murdered, Kathy Blueford Daniels is still turning her ongoing grief into action by supporting initiatives like this. In July of 2006, Daniels’ son, Patrick Charles Murphy, was gunned down in the parking lot of the A-Mart, located in the 7100 block of Parker Street over mistaken identity. Murphy was 20. Calandrian Simpson Kemp was in attendance and believes it is imperative that the “Unity and Peace Walks” continue so that it shows the city of Houston and surrounding areas that the community is here to restore, rebuild and build a better community by ending gun violence and community violence through training and education. Kemp’s son, George Harold Kemp Jr., 20, was murdered in September 2013, after sustaining several gunshot wounds after a verbal confrontation. Community leader and local minister Robert Mu hammad, said the event made him feel comforted and fulfilled, watching Christian Brother and Pastor E. A. Deckard and Muslim Brother Deric Muhammad uniting to serve the community in the cause of peace and ending the bloodshed. 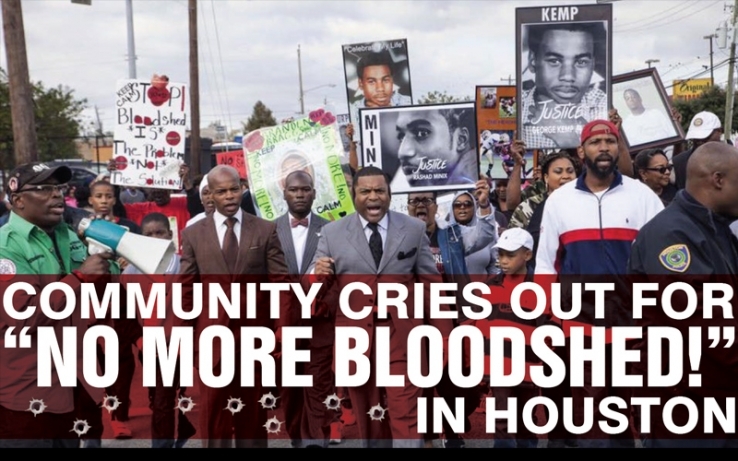 For more information, there is a Facebook page entitled “No More Bloodshed” and everyone in the Greater Houston area is invited and encouraged to attend the next ‘Unity and Peace Walk’ on Saturday, December 19, 2015 at Swiss Village apartments off Homestead Rd and Tidwell, where a murder took place just this month and in January there will be another event held in Southwest Houston. More details will be forthcoming. The Houston Forward Times will continue to keep the community abreast to upcoming events.